[SatNews] A Russian Rokot carrier rocket orbited a Gonets-M satellite and two Kosmos satellites on Wednesday, a Russian Defense Ministry spokesman said. Gonets-M No. 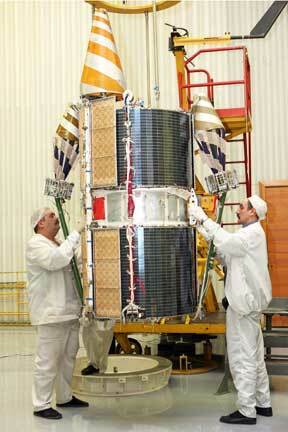 2 satellite being prepped for transportation to Plesetsk. Rokot lifted off from the Plesetsk space center in northern Russia at 07:30 am Moscow time (03:30 GMT), Lt. Col. Alexei Zolotukhin said. The Kosmos satellites will be used for military communications, while the Gonets-M will be part of Russia's large-scale Glonass satellite navigation system, which is the Russian equivalent of the U.S. Global Positioning System, or GPS, and is designed for military and civilian use. Both systems enable users to determine their positions to within a few meters. 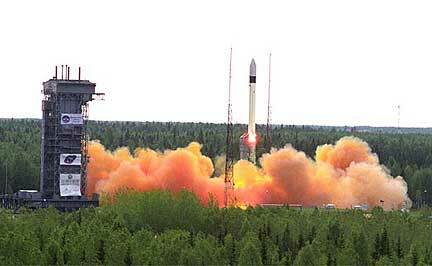 Russia currently has a total of 26 Glonass satellites in orbit, but two of them are not functional. The system requires 18 operational satellites for continuous navigation services covering the entire territory of Russia and at least 24 satellites to provide navigation services worldwide. By mid-October, a total of 23 satellites are expected to be operational.